I guess if you happen to venture to a Vietnamese restaurant for a meal you would definitely order their fresh Vietnamese rolls. The fried version of this is called Cha Gio which does resemble the Chinese fried spring rolls. 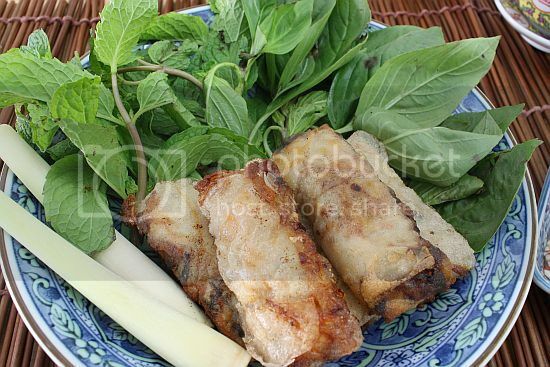 Cha gio comes in many different sizes and can be made with spring roll wrappers or rice paper. 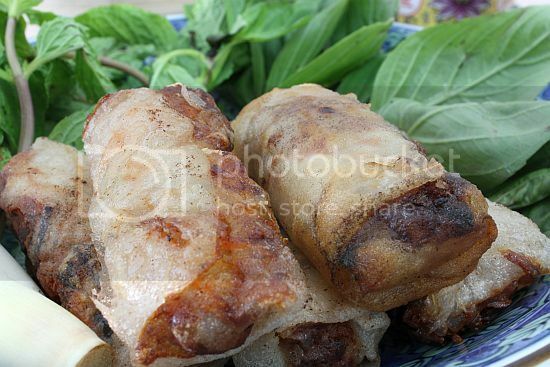 Traditionally, rice paper is used in Vietnam to make this rolls and you would likely find the filling to be made from pork, shrimps and crab meat. This is a really simple dish to make and makes for a delicious tea-time snack or an appertizer to a main meal. 1) Place all ingredients into a bowl and mixed well. Leave in the refrigerator for about an hour before using. 2) Place some warm water into a large shallow plate. Set aside a clean dry kitchen towel on a flat surface. Quickly dip a rice paper into the water and place on top of the kitchen towel. Place 1 heaped tablespoon of the filling on the bottom 1/3 of the roll. Fold the bottom part of the rice paper over the filling. Then tuck in the sides, then roll to form a cyclinder about 3 inches long. Lightly dampened the edges to ensure that the roll is properly sealed. 3) Heat oil over medium heat in a wok or a large frying pan. When the oil is hot, gently place a few of the rolls into the oil Do not over crowd. Fry slowly until the rolls turn golden brown. Dish out and drain the excess oil by lining them over some paper towels. 4) Serve immediately with a chilli dip and fresh herbs. 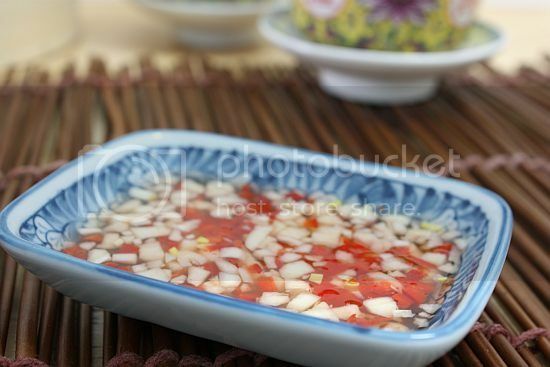 5) To make the dip, minced 3 fresh red chillies and 3 cloves of garlic finely. In a bowl add 1/3 cup white vinegar and sugar to taste. Add in the minced chillie and garlic and set aside for about 15 minutes before using. I am salivating as I'm looking atbthose rolls Jo! 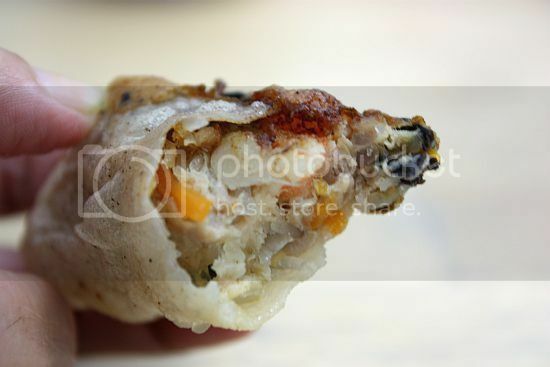 I love the vietnamese spring rolls, but fried ones seems so good! Yum! Thanks for sharing this! Happy Rabbit year to you too! Love Vietnamese spring rolls. The spicy and garlicky dipping sauce is the best! D reach out for these in a heartbeat! Everything from the rolls to the dip looks very good, wish I can have a bite. PS: Happy New Year to you! Hi ladies, thanks for dropping by. Yup I love the fried version as well but wish some one else was doing the frying .. haha. Hi Tigerfish, it is much thinner than the chinese spring roll wrapper. Also you have to work very fast once it is dipped in water otherwise the wrapper becomes too soft to handle. MMMMMMMMMM,...What tasty spring rolls! they look fabulous, Jo!